Classy Spanish electronic outfit Galaktika Records released it's first compilation. A mixtape combining present and past. What you will get is the well balanced groove and melody all through Galaktika's musical history and future. First CD mixed by label boss Maurice Aymard gives snapshots from the forthcoming days of the label. Garnica, Sian, Iñaqui Marin, Patrick Zigon, Paulo Olarte or Gui Boratto are the ones from who you will hear clean and intimate tracks. Second CD is a hommage to the past and to the releases that made this reputation possible. Pablo Bolivar creates an easygoing techno experience, voyeuring the melodic and dubby aspects of the sound. 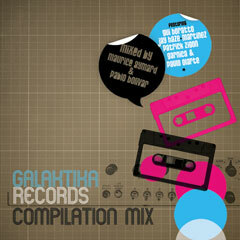 27 tracks mixed under a fashion of ultimate Galaktik experience. Galaktika is surely one of the best labels to come out from Spain. They have the cleanest sound around. Really worth listening and following. Congratulations.